It all began with the Defy El Primero 21, the revolutionary hundredth-of-a-second chronograph. Then came the first Defy Lab, the world’s most accurate mechanical watch with an unprecedented oscillator. At Zenith today, the future of watchmaking can be summed up in four letters: DEFY. 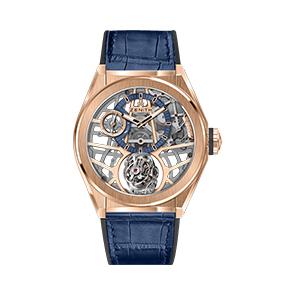 A modern collection encompassing various degrees of horological complexity. A gateway into this futuristic universe, the new Defy Classic oozes charisma through all 41 mm of its titanium case framing a stellar dial decor, coupled with a choice between a metal bracelet and a strap in leather or rubber. In 2017, Zenith wrote the first chapter of tomorrow’s watchmaking, with the launch of Defy El Primero 21 – the exceptional hundredth-of-a-second chronograph – and the first-generation Defy Lab, the world’s most accurate watch thanks to its new monocrystalline silicon oscillator. DEFY with its futuristic DNA has now given rise to a full-fledged collection featuring several degrees of mechanical complexity, starting with the new Defy Classic, a three-hand plus date watch. With its case forged from ultra-light titanium, its blackened skeleton movement, its star-shaped openworked dial and its shade of blue reflecting the collection’s original colour, this Zenith watch propels casual chic elegance into a whole new dimension. Powered by icons of precision and performance, DEFY sets an elegant and sporty style tone with the new Defy Classic. Hours, minutes, central seconds and date: its essential functions are a distillation of the DEFY aesthetic. Large luminescent baton-type hours and minutes hands and a slim seconds hand with an emblematic star counterweight sweep over five stylised branches also evoking the Zenith symbol. The deep blue minutes ring, punctuated by facetted applied hour-markers, enhances an openworked mechanism sporting contemporary finishing. In a nod to the collection’s legendary origins, this is the exact same shade as its illustrious predecessor, the 1969 El Primero. References to the past stop there however, as DEFY thrusts watchmaking firmly into the future. Beating inside its light titanium case is a Manufacture Zenith movement – the famous automatic Elite 670 base calibre – reinterpreted in DEFY model. For the very first time, this reliable and accurate engine, fitted with a silicon pallet-lever and escape-wheel, is revealed by means of an ultra-modern openworked approach. Blackened, structured and topped by a cut-out date disc read off on a white dot at 6 o’clock, it oscillates at 4 Hz and enjoys over 50 hours of autonomy. Fitted with an integrated metal bracelet composed of supple links, a rubber strap coated with alligator leather, or a unistructure rubber version, Defy Classic radiates a blend of distinction and modernity. In 2017, Zenith blazed the trail towards watchmaking’s future with the revolutionary Defy El Primero 21, the only high-frequency automatic chronograph designed to measure hundredths of a second. This year, DEFY appears as a full-fledged collection featuring several degrees of mechanical complexity ranging from three-hand to Grand Complication models. The first embodiment of futuristic Haute Horlogerie, the new Defy Zero G defies the laws of gravity with its downsized and optimised gyroscopic “Gravity Control” module. Zenith’s famous patented device stages a spectacular show at the heart of a skeletonised and grey-toned high-frequency El Primero calibre. Fitted with a sturdy 44mm-diameter case in titanium or pink gold, the Defy Zero G teams its stellar architecture with a supple and ergonomic metal bracelet. A year ago, Zenith wrote the first chapter of tomorrow’s watchmaking with the launch of Defy El Primero 21, an exceptional hundredth-of-a-second chronograph, along with the first-generation Defy Lab, the world’s most accurate mechanical watch with an unprecedented oscillator. Propelled by these champions of performance and precision, DEFY is now a complete and modern collection comprising various levels of complexity. Defying the laws of gravity, the new Defy Zero G (for Gravity) heralds this Haute Horlogerie of the future, with a cleverly downsized and fine-tuned “Gravity Control” gyroscopic module. In the early 21st century, as part of its quest for ultimate precision, Zenith devised a revolutionary self-regulating gravity control device. This patented “Gravity Control” gyroscopic module cancels the effects of gravity on the running rate of the watch, by maintaining the regulating organ and the balance wheel in a horizontal position. In an additional feat, it was fitted in the high oscillation-frequency El Primero movement measuring tenths of a second. Reinterpreted in futuristic mode for the new Defy Zero G, this spherical system composed of 139 tiny components has been entirely redesigned and optimised so as to increase its efficiency and reduce its dimensions. The gyroscopic module – inspired by historical marine chronometers – which previously spun between two convex sapphire crystals, now occupies only 30% of its initial volume and can thus fit perfectly between the two flat sapphire crystals of the DEFY case. This technical, feather-light device appears in all its majesty at 6 o’clock. As a double guarantee of extreme precision, the heart of the new Defy Zero G beats to the fierce pace of the manual-winding El Primero 8812S calibre, oscillating at 5 Hz and self-regulated by the modernised “Gravity Control” module. With its 324 components (including 139 for the gyroscopic carriage alone), this high-frequency in-house movement – heir to the legendary 1969 El Primero – drives the offset hours and minutes, small seconds and gravity control functions, along with the over 50-hour power-reserve indication.